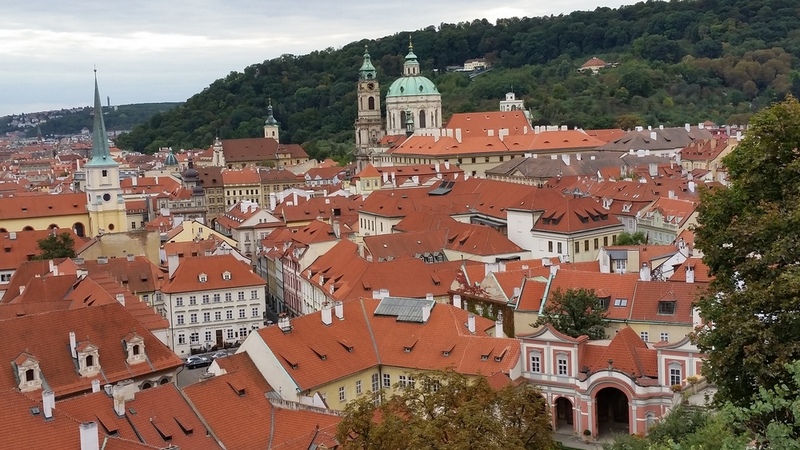 From the top of the Powder Tower, the back of Our Lady before Týn with St. Vitus in the castle in the background. 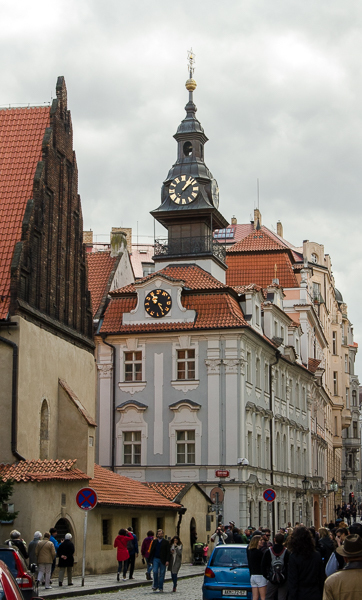 Prague has a scaled down replica of the Eiffel Tower, Petrin Tower. 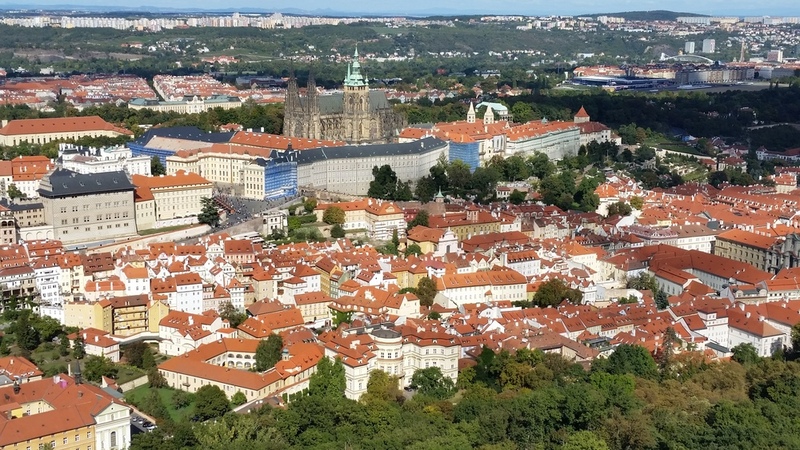 This is a shot of St. Vitus from the vantage point of the Tower. 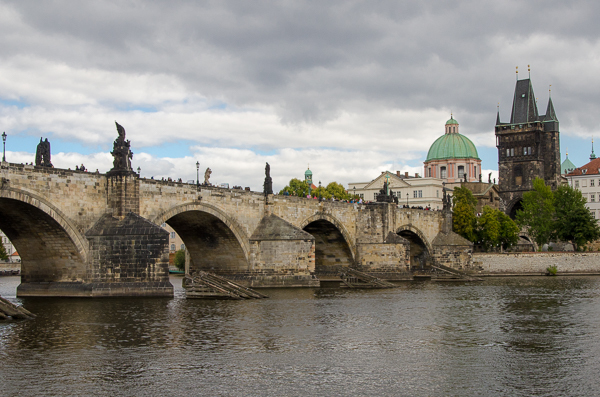 I think this is the Čechův bridge which crosses the Vltava river. Early morning rise to get the right light. Karlův most, The Charles Bridge, with the bridge tower in the back (right). It was built in the 14th century. It reminded me of the Ponte Vecchio in Florence because The Charles Bridge now has loads of vendors on it, though it wasn't built for that purpose. 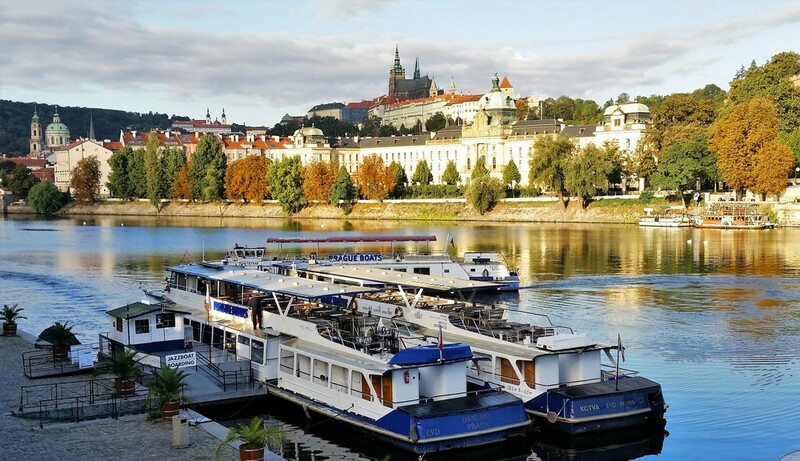 There are a lot of swans in Prague. 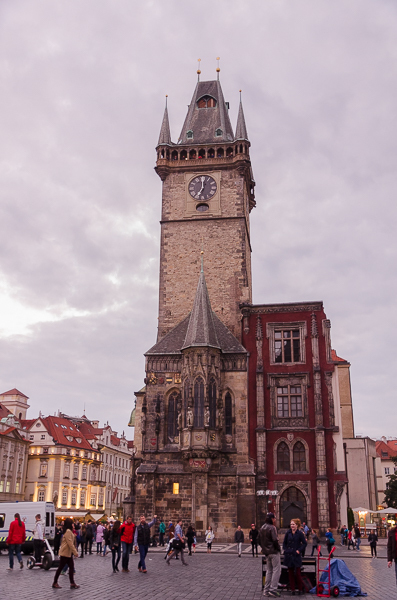 This is the tower on which the astronomical clock is mounted. 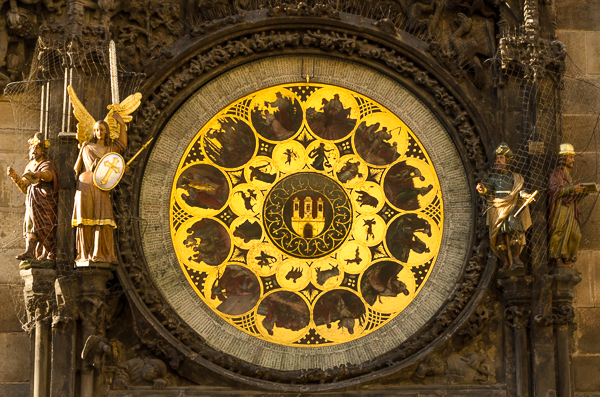 According to wikipedia, it is the oldest operating astronomical clock. At the top, two doors are open revealing "The Walk of the Apostles." Unfortunately, the skeleton representing death--usually perched on the balcony in left of this picture--was under repair. Ringed (in gray) with Saints' Days' names. This dial of multiple rings was really pretty. 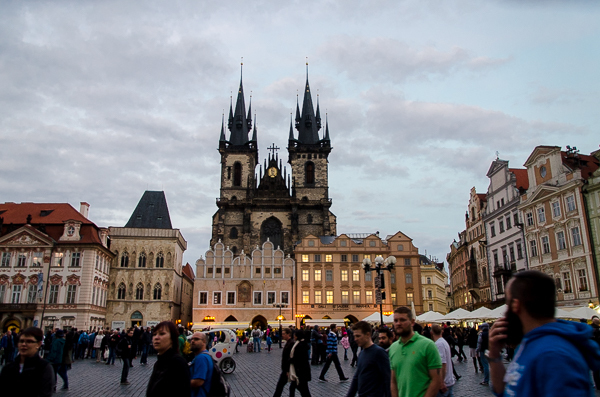 At dusk on a Saturday night, the Old Town Square was filled with people and buskers. Our Lady before Týn rises in the background. 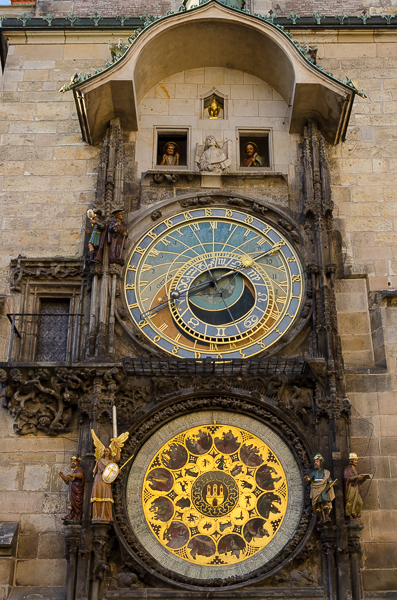 The Hebrew clock is mounted on the Jewish Town Hall. A view of Church of Saint Nicolas in the background and a busker dressed as a statue in the foreground. 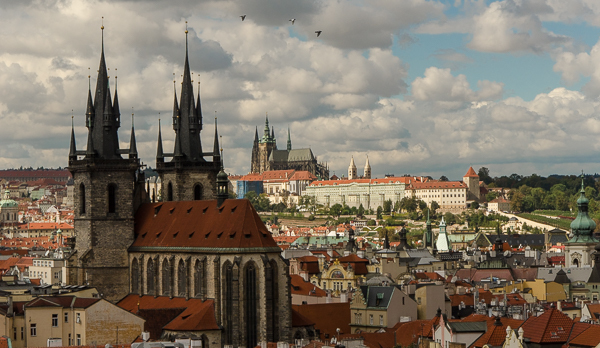 The gothic Cathedral marks the skyline from inside Prague Castle. This is an evening shot from the same vantage point as an early morning shot in this collection.